'World of Dance' Divisional Finals competitor Michael Dameski. Photo by Justin Lubin/NBC. The time had come for 12 of the world’s best acts to battle it out on the World of Dance stage to see who would get once step closer to the 1 million dollar prize. Everything was on the line as the top three acts from each division would compete for a spot in the World Final. Only one act would make it through from each division, and the pressure was on. With guest judge and dance legend Misty Copeland giving input, as well as guest mentor Ciara, this was sure to be a night to remember. From the upper division, Karen y Ricardo were up first and hoped to bring yet another show-stopping performance to the stage. They didn’t waste any time bringing their signature fire to the stage that has set the standard for ballroom. Karen y Ricardo’s routine was full of undoubted chemistry, as well as great partnering sequences from the very beginning. They delivered tricks that were innovative and never seen before and kept the judges on their toes as they watched one transition to the next. Karen y Ricardo certainly came competition-ready to the Divisional Finals round, and it showed in their stellar performance. ‘World of Dance’ Divisional Finals competitors Ashley and Zack. Photo by Trae Patton/NBC. Ashley and Zack were next to take the stage and decided to take a big risk during this round with a big prop. By incorporating silks and material throughout their routine, Ashley and Zack hoped to convey the concept of their routine through artistry. 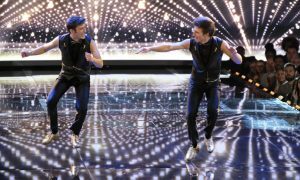 Their performance was poetic in nature and was complemented with smooth partnering, as well as unwavering technique that they’ve been known for throughout the competition. Ashley and Zack’s emotion landed well as they went from one element to the next. Although there were a couple of minor hiccups, Ashley and Zack gave a committed and strong performance overall. 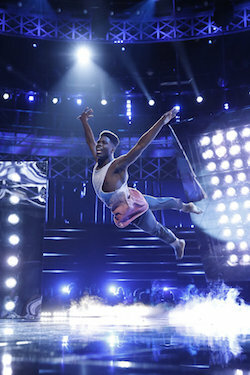 Michael Dameski was the final performer for the upper division to take his shot at making it into the World Final round. He fought from start to finish as he went “warrior mode” in his performance. Michael’s choreography was unbelievable from the moment the music began, and he came out with a vengeance as he channeled an inner struggle. He brought character and poise to the stage with phenomenal technique and athleticism. Michael’s performance was perfection and left the judges stunned. After scoring all three routines, Michael Dameski came out on top with a score of 97.8 and will compete for the ultimate prize in the World Final. ‘World of Dance’ Divisional Finals competitors The Lab. Photo by Trae Patton/NBC. The Junior Team division finalists were up next as the battle to make it into the World Final continued. The Lab was first to perform and set out to school the competition with a creative theme, as well as school desks as props. Their concept was not only creative but out of this world as they incorporated innovative visuals and pictures. The Lab certainly came to fight as they showed great synchronicity and exceptional drive from each group member. They had amazing tricks and elements that kept the audience and judges hyped throughout. Their performance was mind-blowing to the point that Ne-Yo stormed the stage right after. The Lab set the bar high for the other two division finalist groups and left a lasting impression. The Rock Company, known for dancing beyond their years, graced the World of Dance stage next with a performance dedicated to celebrating their joy of dance and the color it brings. They brought a different feel to their contemporary style by mixing in hard-hitting movements, along with their signature gracefulness. There was great technique throughout The Rock Company’s performance, and it was beautifully executed. They made performance magic with cannons and visuals that brought life to the stage. ‘World of Dance’ Divisional Finals competitors The Fabulous Sisters. Photo by Trae Patton/NBC. The Fabulous Sisters took the stage next with a performance based on the Japanese holiday called “Girls’ Day”. Known for their innovative approach to their dance style, The Fabulous Sisters were art in motion from the start of their performance. They complemented their music with beautiful movements that went from smooth to sharp. Their technique was amazing, and they delivered the same unbelievable isolations and pictures that transitioned effortlessly with the music as it broke down. The Fabulous Sisters were full of unbelievable fierceness on the stage as their performance built in momentum. Their performance was strong and extremely detailed and left a lasting impression on the World of Dance stage. With the scores locked in after three unbelievable performances in their own right, The Lab will move on to the World Final after scoring 99.8. The Upper Team division hit the stage next in a battle of the hip hop crews. The Ruggeds, known for their themed performances, stormed the stage first. With one team member injured, The Ruggeds powered through with a creative theme based around brotherhood. Their use of the stage and graphics was phenomenal. They incorporated elements of surprise making it seem as though one person went from one side of the stage to the next within seconds. They showed great athleticism from one element to the next as they powered through various b-boy moments and painted great pictures with innovative partnering work. They certainly brought out the brotherhood of their group and delivered non-stop entertainment. ‘World of Dance’ Divisional Finals competitors S-Rank. Photo by Justin Lubin/NBC. S-Rank brought their signature swag to the World of Dance stage with an astronaut themed performance. Though the tempo of the music was slow in the beginning, S-Rank still managed to bring out the strength in their movements along with great transitions. Their visuals were creative and entertaining as they served up a fun routine that was nothing short of brilliant. Besides being perfectly in sync, S-Rank gave justice to their name once again in a crowd-pleasing performance. Closing out the Upper Team division was Poreotics. Their movements vibrated through the stage and were almost three-dimensional. 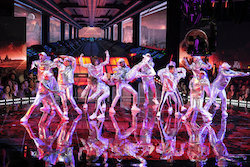 Poreotics served up creative pictures and visuals throughout their well thought out concept and brought the whimsical nature that their choreography is known for. Although there was one slip-up toward the end, the entertainment quality of their routine could not be denied. After this battle of the hip hop crews, S-Rank snagged a win with a score of 94 and will get to further prove their name in the World Final. Ending the night on a high note was the Junior Division. The pressure was on as Charity and Andres, recipients of World of Dance’s first perfect score, hit the stage first. Although Charity was injured with a broken toe, this power duo did not give up. With a great concept under their belt, Charity and Andres committed to each movement and did so with ease. They showed great partnering elements, as well as individual moments that highlighted their individual strengths. Apart from amazing technique, Charity and Andres mixed things up by adding a bit of ballroom to their routine, which further showed their versatility. ‘World of Dance’ Divisional Finals competitor Jaxon Willard. Photo by Trae Patton/NBC. Jaxon Willard took the World of Dance stage next with an emotional performance. He made the simplest movements look effortless as he transitioned from one element to the next. Jaxon showed intensity throughout his performance with the same beautiful technique that he possessed at the beginning of the competition. He was effortless yet athletic in his choreography and made magic on the stage. With a routine based on trust and their journey through World of Dance, Sean and Kaycee closed out the Junior division with a duo that tested Sean’s choreographic ability. With the goal to think outside of the box, Sean’s choreography took shape as he and Kaycee took the stage. The fluidity in their movement was unbelievable, and the intensity within the footwork was beautiful alongside the music. Sean and Kaycee made great use of the stage, as well as the effects they used to tell the story. They certainly pushed the envelope with this routine as they incorporated lifts and different elements that the judges had not seen from them before. After three amazing performances, Charity and Andres will move on to the World Final after scoring a 93.0. The time has come for World of Dance that will test the performers physically and mentally — The World Final round. The excitement is just beginning as we find out who will win the 1 million dollar prize and the title of “World of Dance Champion”. Tune in to see who wins it all!